Bite-Sized | Wake up, Meeples! While it’s not clear what exactly makes a Dominion card “good” or “powerful,” people do card power level ratings anyway. There are many valid and conflicting reasons to rate a card as good or bad, but some cards are consistently rated as very strong across all of these definitions. Knowing which cards are rated this highly can impact the way you look at kingdoms, as they either have very strong effects or are strong enough to include in a wide variety of decks; knowing what these cards and why there are powerful can be very helpful to you as a player. So I’ve compiled a list of roughly the top 10% of all Dominion cards and, with some help, written a short blurb on why each of them is rated so highly. Below is a list of those cards, with links to the appropriate articles. If there is a more detailed (and good) resource on that card, the bite-sized article will link to that as well. This entry was posted in Bite-Sized, Dominion, Tabletop Games on April 8, 2019 by Adam Horton. When you play Villa, it’s not the most impressive effect, it doesn’t draw any cards and only gives you $1. On the other hand, Villa has a unique effect in that it allows you to return to your action phase when gained; there are some synergies here that allow you to do some very powerful things. 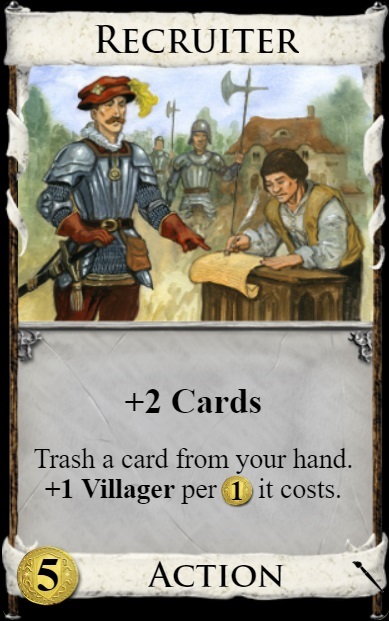 The most common synergy with Villa’s on-gain ability is that you don’t have to worry so much about running out of actions as long as there are Villas in the pile and you can come up with $4 to get one; this is especially strong with draw cards that want the support of a village, as you can build much more aggressively, delaying your village buys until you actually need the actions, and since you usually immediately play the Villa, you don’t lose a buy and get $1 back right away, softening the blow. Villa loves cost-reducers when being used like this, because they further reduce the opportunity cost of gaining a Villa to keep your turn going. Some more exotic tricks that Villa can enable would be synergy with draw-to-X cards, since you can play your treasures in the buy phase, buy a Villa, then play your draw-to-X card for lots of value. If you’re overdrawing a lot, you can draw your deck but keep extra draw cards, buy additional payload cards in that same buy phase, then draw and play them in the same turn. While Villas are still in the pile, you can use this to explode in growth very quickly, which means that emptying the Villa pile for denial purposes is often a consideration. At the start of the game, tournament is already quite strong. Cantrip +$1 has an economic impact similar to Silver, and as your deck improves, it gets better than that fairly quickly. 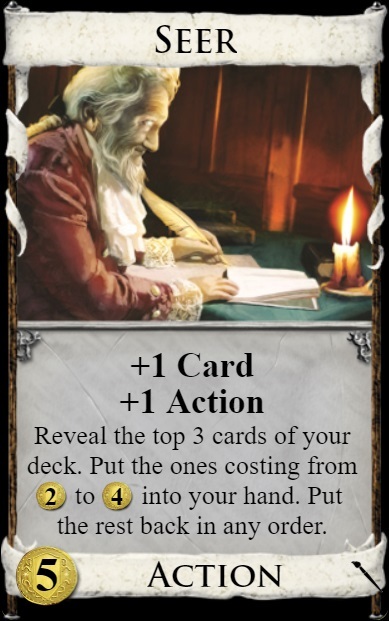 Additionally, compared to a pure payload card like a silver, the cantrip nature is much better for deck control, letting you more easily start chaining cards together..
Obviously, the other text on the card is important, too. Note that turning off your opponent’s Tournaments by revealing a Province can be a very big deal – often even bigger than gaining Prizes. If they would draw 3 tournaments in their turn, then by having a province in hand, you’re denying them drawing 3 cards, plus 3 coins, and potentially more than that, as the lack of ability to draw also increases the chances that their turn stalls out. The prizes are also strong. Generally, Trusty Steed, Princess, and Followers are the strongest, and one of them is almost always taken first. Which of them is best is board-dependent – usually, look for what the rest of the board is missing (village, +buy/payload for many-buys deck, discard attack). Taking other prizes – including duchy – is usually a consolation or an endgame play. Because of the importance of Provinces on both these axes, getting to $8 faster is generally more important than normal. 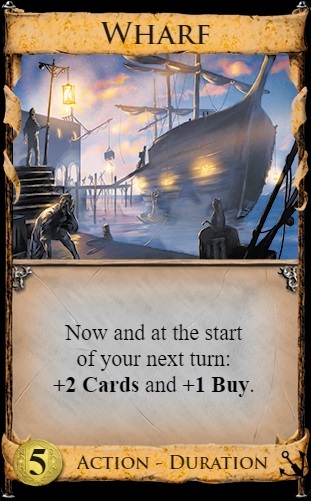 Over two turns, Wharf draws a lot of cards (four in total) and gives additional buys to take advantage of the increased hand size. This combination is strong in almost any deck, with or without the ability to play multiple Wharves in the same turn, because of its independent strength on top of the fact that the effect stacks very well. Wharf decks take a couple of extra turns to draw a lot of cards; and while it might look like an overall weakness to have to wait until your next turn to draw the other two cards, this is where Wharf’s true power lies. The start of your turn is the best time to draw cards because that is when many decks are most vulnerable to stalling. The duration draw of Wharf is strong enough that you don’t even need to trash your starting cards to have a very consistent deck, even though trashing still improves these decks significantly. You can have a lot more non-drawing payload cards in your deck and not have to worry about stalling. Witch is the first junker Dominion ever knew, coming from the base set, and to this day is one of the most powerful. The combination of giving out a Curse and being a halfway decent card to put into a deck is what makes Witch powerful. 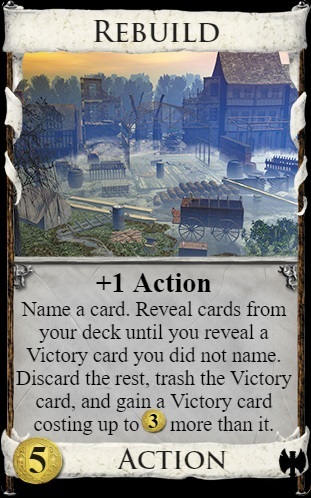 Junking is a very strong effect in Dominion, strong enough that even if the Curses can be trashed, you still usually want to go for Witch along with the trashing just to slow your opponent down. Vampire’s strength comes from the fact that it does several different things for you. In many decks you build, you’ll be able to make use of at least one or two of Vampire’s three capabilities: gaining, attacking, and trashing. The ability to gain a $5-cost card without spending an action is not common, but is very powerful. 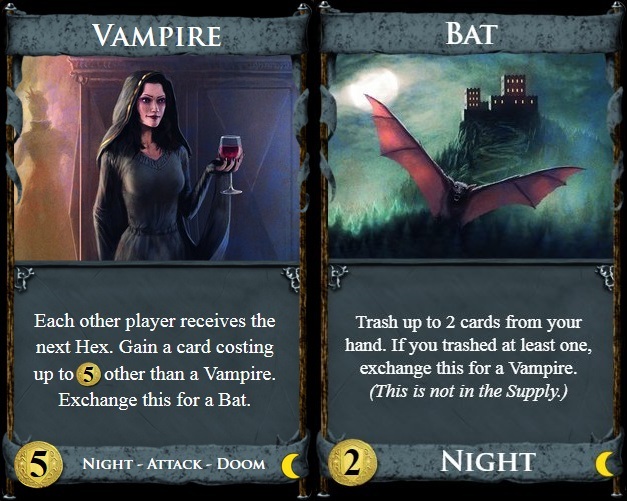 The combination of this plus the fact that Bat trashes cards, push you towards gaining a Vampire the first time you hit $5 in a lot of cases. Be advised, though, that Vampire/Bat’s gaining and trashing together make it difficult to increase the size of your deck over time. Bat’s trashing is fairly slow to get online, you have to hit $5, then play your Vampire, then play your Bat. In addition, without any draw it can be difficult to line your Bat up with things you want to trash by that point, making the trashing part one of the weaker abilities of the Vampire/Bat duo, but still nice to have in most situations. Similarly, the hexing attack will sometimes not have a huge impact on your opponent, but is almost always nice to have in addition to the other things Vampire is doing for you, mostly gaining $5-cost cards. 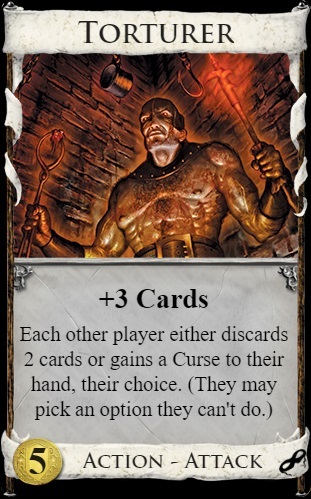 Torturer is one of the only discard attacks that stacks with multiple plays, meaning that you can force your opponent to either take a lot of Curses or discard all the way down to zero cards in hand if you can play enough Torturers in a turn. For this reason, Torturer is the focal point of most kingdoms where it appears with a village. Keep in mind that you shouldn’t always discard to Torturer — if you give up chances to play your own Torturer, your deck may stay clear of Curses but you won’t win. Most games like this revolve around just playing as many Torturers as possible until one player has been beaten into submission. Only strong trashing can prevent this kind of scenario, because that type of deck can power through the Curses until they are gone, rendering Torturer’s attack mostly inert. Rebuild is one of the less popular cards in the game, in part because it’s so powerful on its own. Rebuild is powerful because can score a respectable amount of points and then end the game quickly while taking away opportunities for other decks to catch up. Most synergies with Rebuild revolve around cards that help you play more Rebuilds. Most other types of support don’t end up being helpful, and Rebuild tends to not fit into decks with other game plans very well. When uncontested, Rebuild has the potential to end the game extremely quickly. The best plan for this deck is often to trash Provinces and regain Provinces, just to empty the pile as quickly as possible, only turning for more points if necessary. When both players pursue a Rebuild-focused strategy, things change a lot. Winning the Duchy split is usually game-decisive, so you usually name Duchy with your Rebuild unless Duchy is the only target in your deck. 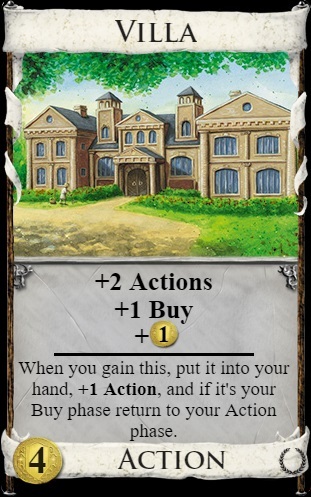 Getting caught with an Estate in your deck when the Duchies are gone is a huge negative. For more detail on Rebuild mirrors, check out this article. The ability to get the full package of draw (that is, increasing your handsize while maintaining your ability to play more action cards) from a single card is very powerful, and any card which allows it without having to jump through too many hoops deserves significant consideration. 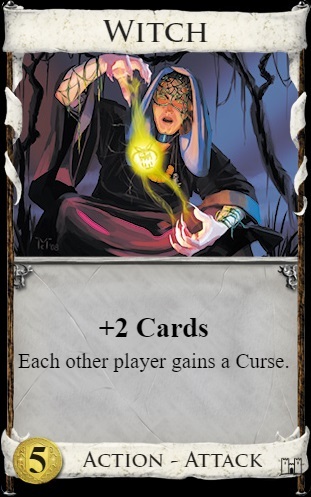 Seer gives you this ability, with the only stipulation that the cards need to cost between 2 and 4. In general, if you are drawing less than one extra card off Seer, it’s mediocre; at around 1 card, it’s pretty decent. But it’s when you start getting multiple extra cards from a single Seer that it starts to get particularly powerful. Will you get to that point? That depends a lot on how you build your deck – how well can you get rid of your coppers? Are you getting junked? Do you want cards that cost 2-4, or does most of your ideal deck cost 5+? Of particular note is that, barring cost-reduction, Seer doesn’t cost 2-4, meaning that you can’t just build a stack of only Seers and have everything draw beautifully. Overall, though, the range is really wide on how good it will be, and you need to look at every case on its own merits; thankfully, this is not so hard to do, so long as you roughly know your plan and your deck’s composition. One note about the action phase when playing multiple Seers – try to give each Seer the maximum possible search space to hit draw-able cards; this is done by not having multiple wrong-costed cards on top of your deck when you play it, playing other draw cards (most often cantrips) in between Seers when necessary. Recruiter is a very powerful thinner and a very powerful village. It lets you trash a targeted card from a fairly wide range – one more than the number of cards in your hand when you played it. In most cases, it’s effectively nonterminal, as the villagers usually more than pay for the action cost of the Recruiter itself. It does not actually increase your handsize, since you have to trash a card, but being handsize-neutral is already better than almost all other trashers. If you’re willing to feed it a bit you can use it as a village extraordinaire, sometimes even powering all the remaining terminals in your deck. It’s almost always worth getting one on an early $5 hand, and often it’s worth getting a second. Do note, though, that there are diminishing returns, as can be the case with many trashers.